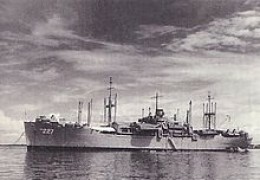 Reinville Ship of America (USS) ,place of Peace Conference between Indonesia and the Dutch in 1946. Present and Future Roles of America People of Indonesia will ask for themselves, there are some or group of Indonesia that condemn American International policy of dual standard. While at the same time people can see American symbols are present in the community as the McDonald, California fried Chicken (CFC), Kentucky Fried Chicken (KFC), and the Stripe and the Stars flag symbol are seen stamped in front of people cars. The flag are frequently found painted in the nose of trucks. They are the empirical facts that many people in Indonesia are pride and appreciate US symbols. As my knowledge and a glance observation there is no other country symbols is present in the people belonging except Japan. Japanese symbol is only in Japanese made cars. And some younger who fall in love with Korean film star, but it is very limited number of young people. It is the real condition of acknowledgement of a people of a nation in Asia toward American. American role as I see in the present Asian situation of economy and culture and military as a most challenging. There is China that dominates in economic (in market) with its dominant merchandises, but it is just influencing the market condition, not to the people that wear the goods made of China. The video or photo show how people of this country feel in their mind. By drawing or sticking fag is indicating of a deep feeling of love. Like the supporters of a soccer/football will copy or paint the flag of the beloved club in their shirt or clothes. The USA flag image that is painted by people own the truck is representing the feeling of love the the people of the country having the flag. I am sure and know the driver or the owner of the truck do not know the rules of the condition how to treat with this symbol of a country. They also do not know how to paint the flag correctly . It is seen the flag that painted in the back of the truck is not the same with that on the driver door. But I am sure they all like the fag, and they wanted to appreciate the flag by their own ways. In this case, the world witness once more how America is appreciated in a this country. The author wish to go on writing to ask the most challenging country to promote the just and permanent settlement of dispute in part of Middle East, especially the Palestine issue. The world has witnessed, the settlement in South East Asia in 1948 as promoter of Renville Conference leading peace and independent of Indonesia, and the Camp David in 1978 has made peace between Egypt and Israel. and hopefully in 2018 or sooner there will be just and peace in the Middle East by US initiative. Really, it is a challenging role. And the president of US Barrack Obama was ever live in Jakarta, makes America more popular in this region and his visit to Asia and Jakarta.